The Ab Coaster is a revolutionary exercise device that is taking abdominal training in a whole new direction. Unlike traditional crunches, which work your abs from the "top down," the Ab Coaster works your abs from the "bottom up," while limiting stress to your neck, back and shoulders. Gymnasts and body builders have known this secret for years: to get a strong, lean core necessary for competition, they work their abs from the bottom up. 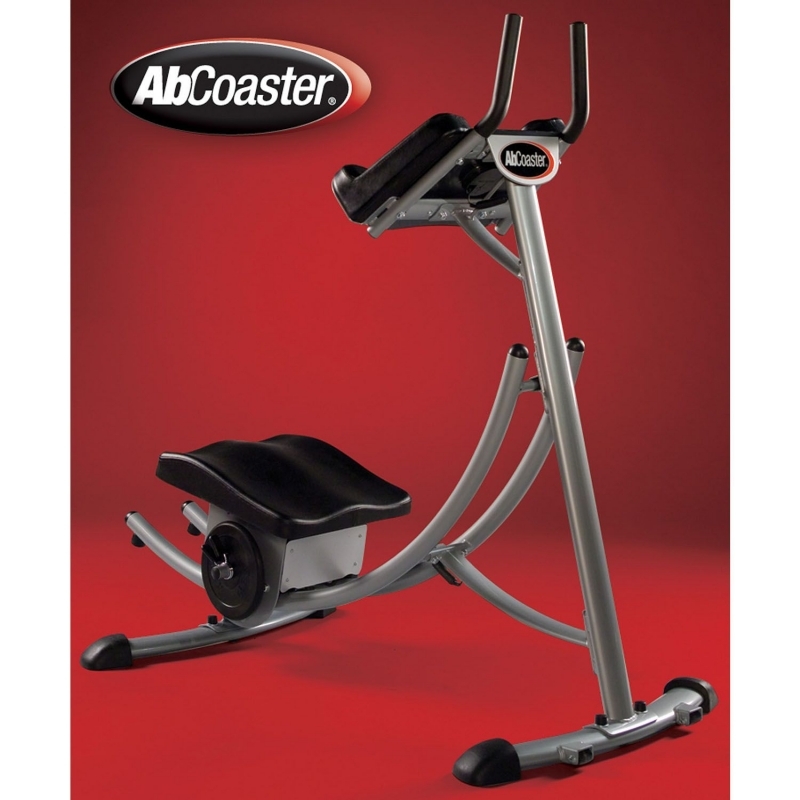 Let the FitnessZone® sales staff help you navigate through the various models of our Ab Coasters. Our expertly trained staff can assist you in selecting the Ab Coaster that will custom fit your needs as well as your budget! Call us ANYTIME at 1-800-875-9145 to go over the different types of Ab Coasters we offer. We ship any model for FREE!! The Ab Coaster combines the simplicity of the ab crunch with the effectiveness of the hanging leg raise. The curved track mimics natural spinal flexion, allowing anyone to perform an abdominal lift in perfect form, regardless of fitness level. The Ab Coaster promotes core stabilization while exercising the abdominals through a full range of motion. The ergonomic carriage places you in a comfortable kneeling position, isolating the abdominal region and virtually eliminating any hip flexor involvement. The multi-angle adjustable seat targets all areas of the abdominal region. Plate-loading posts allow users to add resistance for advanced fitness levels. The multi-angle adjustable seat targets all areas of the abdominal region. Plate-loading posts allow users to add resistance for advanced fitness levels. neck , back and shoulders. The Ab Coaster works your abs from the “bottom up,” while limiting stress to your neck, back and shoulders. The Ab Coaster promotes core stabilization while exercising the abdominals through a full range of motion. The ergonomic carriage places you in a comfortable kneeling position, isolating the abdominal region and virtually eliminating any hip flexor involvement. their abs from the bottom up. The Ab Coaster combines the simplicity of the ab crunch with the effectiveness of the hanging leg raise. The curved track mimics natural spinal flexion, allowing anyone to perform an abdominal lift in perfect form, regardless of fitness level. for developing great abs. But it is a very difficult exercise to perform. the entire weight of your lower body. Hanging Leg Raise: The Ab Coaster makes this difficult exercise possible for anyone to perform. This exercise sounds hard because it is hard. In fact, for the average person, this exercise is nearly impossible.But not anymore. The Ab Coaster makes this difficult exercise possible for anyone to perform. Its weight-bearing design elim-inates the need to hang from a bar and places the user in a comfort-able kneeling position off the floor. The Ab Coaster’s curved track guides you through a perfect lower abdominal lift while eliminating strain to your neck, back and shoulders. 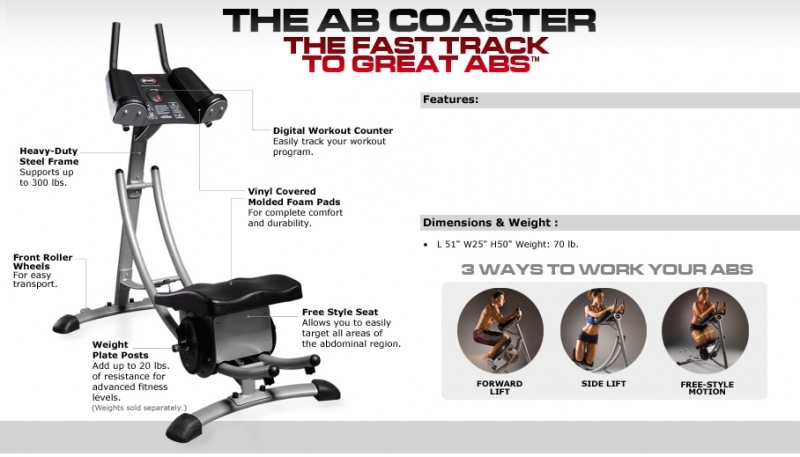 The Ab Coaster engages your abs from start-to-finish, giving you a constant core contraction with every repetition. The multi-angle seat adjusts to target your obliques at every angle for a complete abdominal workout. The Ab Coaster’s patented design, combined with its plate-loading resistance system, allows anyone— professional athletes, health club members, and home exercisers—to achieve great abs in the most effective way possible. Let the FitnessZone® sales staff help you navigate through the various models of smith machines and power racks. Our expertly trained staff can assist you in selecting the Smith machine or power rack that will custom fit your needs as well as your budget! Call us ANYTIME at 1-800-875-9145.